Odense  is the unofficial capital and largest city on the island of Funen (da.Fyn) in Denmark. As Denmark's third-largest city, it offers the traveller a mixture of an exciting vibrant night-life, beautiful street-scapes, great shopping opportunities & a rich cultural heritage. An example of the many 15th & 16th Century buildings in Odense. A picturesque street in Odense's Old-Quarter. Odense is roughly in the centre of Funen, which lies between the larger Zealand island & the Jutland peninsula. The first recorded reference to the city dates back to 988 AD in a letter from the German Kaiser Otto III. Some recent archaeological findings have indicated that a settlement has in fact been around since the Viking period. At that time, however, Odense was just the small centre of the Odin cult. In 1100, the first monastery, St. Knud's was established by English Benedictine monks. Up until the middle of the 17th century, Odense enjoyed the position as a main trading-centre for the people from the surrounding areas. Local produce & livestock were exported from the city. 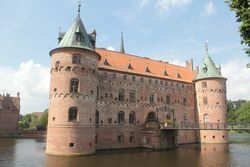 However, a war with Sweden in the 1600s weakened the city's economy. This economic downturn continued until 1803 when a canal linking Odense & the Baltic Sea was opened. This swiftly changed Odense into a port city & over the next 100 years Odense quickly developed into the modern industrial city which it is today. Currently Odense has a population of 185,871 people, thus making it Denmark's 3rd largest city. Odense is also the birthplace of the world famous fairytale writer Hans Christian Andersen & the city proudly displays statues, parades & monuments in his memory. Andersen was born on 2 April 1805, in a tiny house on Munkemøllestræde, quite close to the cathedral. During his lifetime, Andersen created many famous fairy-tales which today are internationally famous. For example 'The Little Mermaid', 'The Ugly Duckling' & 'The Snow Queen'. Copenhagen/Kastrup Airport take the train from the airport directly to Odense via Copenhagen City. This trip can take between 105 and 120 minutes. (Note: On trains leaving from Copenhagen Airport it is important that you clip your train ticket prior to boarding). Billund Airport, take the local bus to either Kolding or Vejle & then get a train from there to Odense. Trains depart roughly every 30 minutes during the day & every two hours after 1am. The total trip is roughly 90 minutes. DSB provides rail-links between Odense & many of Denmark's major towns & cities. The trains are of exceptional quality, offer very comfortable seating & have food + drinks served en-route. During peak times it might be advisable to book a seat. This is generally not required very early in the morning or late at night. Trains are quite regular & arrive generally on time. Ticket checks take place on every journey, thus it is vital that you are in possession of a valid ticket at all times. Smoking is not permitted anywhere on the train. Around 105 minutes from Aarhus. Between 80 and 110 minutes from Esbjerg in southern Jutland. Between 4 and 5 hours from Hamburg in Germany. For further details on train schedules, destinations & other services visit,  . 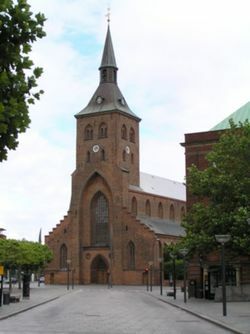 Odense is situated in the centre of the island Funen (da.Fyn), and although not technically correct, many Danes consider it to be the centre of Denmark. The main highway between east (Zealand) and west (Jutland) Denmark, the E20, runs trough the southern suburbs of the city. If you are driving from Germany, this highway branches of the highway from Germany (E45) right after the Kolding Ø exit. It is important to note that there is a toll for crossing the Great-Belt Bridge from Zealand to Funen, the cost is 235 DKK one-way. The cream coloured buses from FynBus  travel to Odense from locations all over the island of Funen, Fredericia in Jutland, and Nykøbing on the island of Falster. Regional buses arrive at & depart from the regional bus hub which can be found behind Odense Train Station on the north side of the railway. These are not to be confused with the local buses which depart from within the train station terminal on the south side of the railway. The Intra-city buses can be recognized from the regional buses by the length of the line number. Two-digit number lines are intra-city while 3-digit numbers are regional and inter-city. Odense City has been made accessible to yachts by the construction of a 7 km long canal from Odense Fjord to the old harbour. There are several marinas, however it is recommended that you make sure they have visitor berths before you arrive. You can also dock at marinas in Svendborg, Faaborg or Kerteminde. Then a connecting train or bus would link you to Odense. Most of Odense's attractions, bars, restaurants & shopping areas are very easily accessibly on foot. All of the city's main hotels & hostels are located within the city centre or train station areas. As a general rule all of the major attractions in the centre are between 5 & 10 minutes of each other. A major exception to this is 'The Funen Village' (Den Fynske Landsby), which is about a 45 minute walk along the river. Similarly the zoo is on the same route & is roughly 30 minutes from the city centre. Both of these attractions are sign-posted all the way along the river. On a Friday or Saturday night taxis can be found all over the city. You can hail a taxi on the street, or ask in a bar/restaurant for them to get one sent to come pick you up. It should be noted that taxis do cost more at night time. For those interested in a more relaxed break, a river boat (Odense Åfart) can be taken from the bridge in Munke Mose Park (Nyvestergade) to the Zoo & to the forest next to 'The Funen Village'. The journey, which takes around 30 minutes, is a very relaxing way of seeing Odense river, the Danish countryside & to just relax on a summers day. Sometimes live jazz bands occasionally play on-board during the summer months. Row-Boats & Paddle-Boats can also be rented at the same location. The buses from Odense Bytrafik are available all over Odense, and fairly frequent. All city buses cost 18 DKK for trips in the city, or 20 DKK for trips in the suburbs as well as trips between the city and the suburbs. A map of available bus lines can be found here . The the Funen village take city bus 21 or 22 or regional bus lines 110 or 111, throughout most of the day these lines combined makes for departures every 10 minutes from the city centre. For Odense Zoo take bus 110/111 from the train station to the Skt. Knuds Gymnasium stop and walk from there, these buses depart around every 30 minutes and cost 20 kroner. The regional train from Odense to Svendborg has a few stops in the Odense area. For example there is a stop at the picturesque Fruens Bøge area which is relatively near to The Funen Village. Odense is generally a safe town for visitors, although criminal activities and violence occur and caution is recommended late at night. Although there is not really any reason for tourist to venture there, the Vollsmose area, is infamous in Denmark for its crime, social decay and a recent terrorism case. The problems are, however, highly exaggerated by the media and you will find the Vollsmose area to be no more insecure than most places. 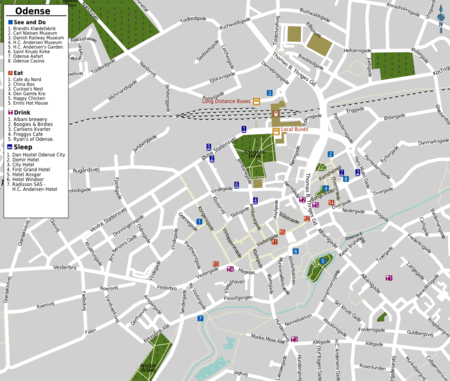 Maps of Odense can be purchased in the two shops in the train-station for 10 DKK. Similarly there are maps placed all around the town for visitors, Most ATM machines in Odense close between 2am & 6am, some shops only accept Danish credit cards & will not take foreign cards, but most of them normally accept Visa and American Express. Post offices can be located in the Brandts Passage, Føtex supermarket on Vesterbro street & Rosengård Centre. Many cities nearby in the Funen island can be reached by Bus with a trip of around 1 hour from Odense. The bus trips are provided by FynBus. During holiday seasons (see the website for the dates) you can buy Tourist Tickets for 50 DKK or 150 DKK for a group of four. With this tickets you can travel in the whole island for the day and visit many different towns. Town to town transport usually takes between one or two ours. You can use the Journey Planner website or app to check the buses and timetables. Kerteminde, Located about 20 km to the northeast, this cute seaside town with a large center of old 18th century houses offers beautiful beaches, mini-golf & an aquarium, complete with sharks. Ringe, an agricultural town in center of the island of Funen. Nyborg, a coastal town which is complete with a medieval castle, beautiful gardens & walks by the harbor. Copenhagen, Denmark's capital city. Only 90 minutes by intercity train. Visit the Mermaid, Tivoli Theme Park or the Carlsberg brewery. Fåborg, a coastal town to the southwest. 1 hour by bus, it has a nice view on the harbor and it a nice place to walk. This page was last edited on 2 April 2018, at 13:55.